Note to Visitors: If you have any questions or concerns please contact us by email through the contact form. Before commenting we suggest you read our Terms of Service here. If you wish to read OWON's Disclaimer, it can be found here. We hope you enjoy your visit - finding informative, useful information and joining the debate in the comments section. The following will explain the layout, functionality and how to navigate the site. Click on any image to view in manual slide show. This is the first page you will see when you arrive at OWON. It is most commonly known as the "HOME" page or landing page. This contains our site title and brief site description. Right below this is the "MENU" bar (image below). The "MENU" bar contains tabs for navigating the site to desired locations. You will find the "MENU" bar on every page of the site to assist you with navigation. The tabs are self explanatory so we will not go into it in detail. Most of the tabs it contains will be explained later in this tutorial. Remember the "MENU" bar is on every page so just click on "HOME" to start over on the "HOME" page from wherever you are if you need or want to. The next section is the introduction to the site which contains an explanation of why we are here and the challenge we face (image below). We live in a very challenging time. It is our hope that being informed and aware to what is going on around us can bring an understanding and the want to change the world for the benefit of all. All inclusive. The following section is the "POPULAR POSTS" section. It is a dynamic montage of article images and titles (image below). The "POPULAR POSTS" section will display the top 10 most frequented articles since the sites conversion from our old site (May, 2014). This means they have received the most page reads since May, 2014 (comment section posts excluded). Simply place your cursor on any one of the images or titles below the image and click. You will be taken directly to that article. Images will move from left to right and revert when necessary. 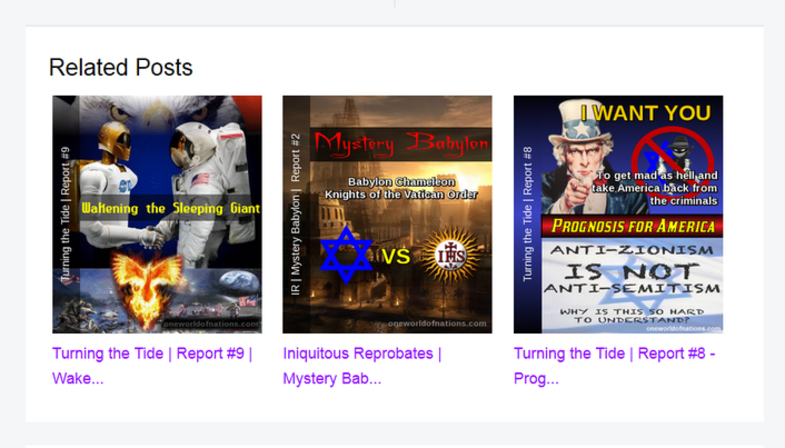 OWON's most popular article of all time will always be Our Last Stand | Report #3: Stories of Our Cabal Shadow Government Thieves, Global Criminals and a Tale of Treason. Not only on our website, but on others as well who chose to run it. It is an introduction to what The White Hats Report #48 was going to be. We advise all to read it and understand what happened and where we are. The next section is "RECENT POSTS & CATEGORIES". Some may find it confusing, but once you understand how it functions it is very useful for navigating the site quickly and effortlessly, as well as having a visual image montage of what is new and the many "CATEGORIES" of series articles. Depending, it may be much slower than the "BLOG ARCHIVE" (which will be covered later), to retrieve older articles. See images with descriptions, also explanations, below. The "COMMENT SECTION" (left - bordered in yellow) is where both OWON Team members and visitors engage in debates and share information on a vast array of topics. OWON has a Global following as well as the ears of some highly placed individuals directly involved in future planning for humanity. So we urge visitors to comment and let their voices be heard. You ALL matter. It is also where OWON Team members or Associates will answer questions and/or update visitors concerning the Global Foreign Relations Projects, World Global Settlements (WGS) and Currency Revaluations (GCR). 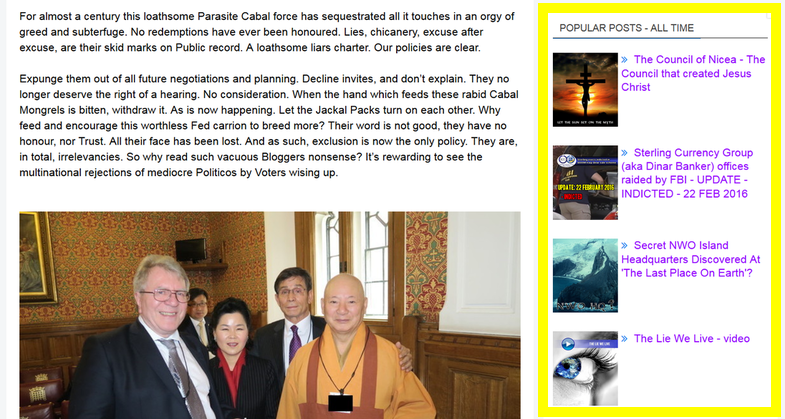 "RECENT POST" is typically an exclusive article (image above / middle - bordered in yellow), are penned and graphically supported by OWON Team members or an article that OWON will feature as a guest post / historical interest and is significant in today's world. They are informative and recommended reading for visitors who wish to have a knowledgeable grasp on today's ever changing world. It is also where OWON Team members or Associates will update visitors concerning the Global Foreign Relations Projects, World Global Settlements and Currency Revaluations. Information is power and there is a vast array of it on this site. The internet is scanned for current news of interest (image above - bordered in yellow) as well as some humor to brighten one's day. Keep up to date and current with reading these "IN THE NEWS" articles. 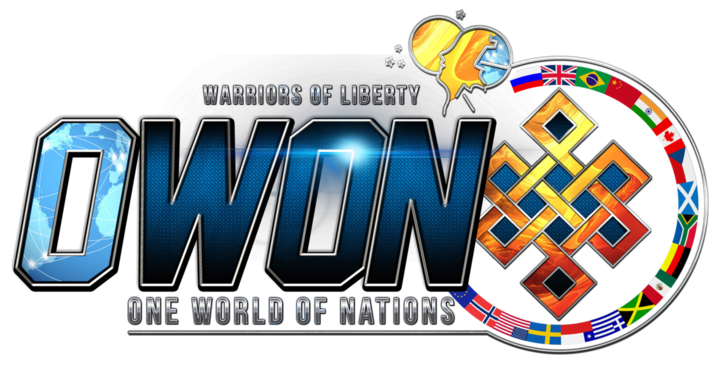 Also they will have an introduction penned by the OWON Team as to what their significance is. Stay relevant, stay informed. Now how to navigate the "CATEGORIES" section to view archived articles. Above is a sample image of only three blocks (of the nine) that have a 'Polaroid Pile' highlighting various "CATEGORIES". Simple click on the image or title to view archived articles in image montages based on the series chosen. There is a maximum of how many images can be displayed at one time per page. Hover cursor over the image to read title, snippet and date of posting, click image to read entire article. Note to Visitors: Once leaving the main page to view archived articles, all articles will follow chronological order depending on date posted. If you just want to see chronological order of posts, just keep clicking "NEXT" (bordered in yellow, image below) under the "RECENT POSTS AND CATEGORIES" table on the main landing (HOME) page. The "HOME" page displays 12 blocks, but once you hit "NEXT" each page will differ in amount of blocks depending on size of articles shown because there is data limit per page. Just keep clicking NEXT and everything is based on date posted (all articles) or archived (for comment sections only). Next is the "CONTACT" section (image below) - pretty self explanatory. Just be sure to fill in ALL the blanks with relevant information for it to function. It can be accessed by scrolling to the bottom of the main page here. It also can be found on the "MENU" bar on every page. 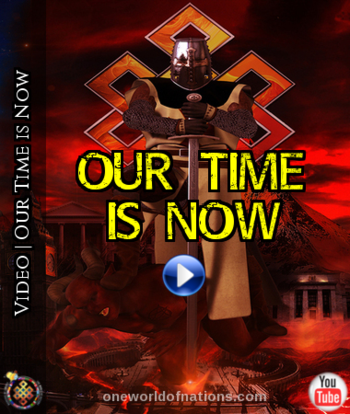 We will now use Our Last Stand | Report #5 | Helping you all understand what is REAL! article in the next few images to explain the layout and function of the side bar column. Notice the "MENU" bar is there for your use. We will divide the article page into several parts (images) so it can be more easily show each item that needs focus. We will not explain the whole page but rather just hit on some key information and navigating tools. 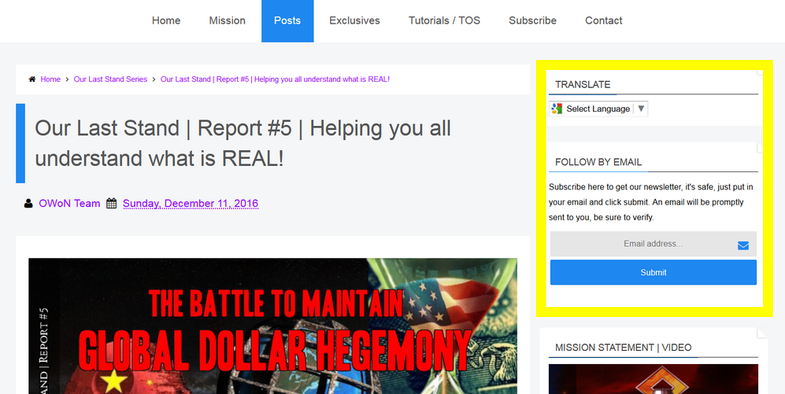 In the above image (boxed in yellow) is the translation tab and our newsletter subscription. For translation just click on the down arrow and select language. To receive OWON's newsletter just fill in your email address and a verify email will be sent. Be sure to verify the email that is promptly delivered to your email inbox to receive our newsletter. If the verification email sent to you is not verified, the newsletter will not be sent. If you have not received the verification email within a few minutes check your spam folder. If still not found, try again or contact us for assistance. The two "POPULAR POST" sections operate the same way except for one difference. "POPULAR POSTS - LAST 7 DAYS" is just that (image above - boxed in yellow). The top 10 (due to sizing for this tutorial, image only shows 4) most popular posts over the last 7 days. "POPULAR POSTS - ALL TIME" is for 'all time' 10 (due to sizing for this tutorial, image only shows 5) top articles spanning over 5000+ articles and growing daily (image below - boxed in yellow). "CATEGORIES" (image below - boxed in yellow) work the same as the "CATEGORIES" on the main page, just in list form as opposed to image montage. Simply click on one category and see all articles on this site which suits the category description in an image montage. Once you have selected a category place your cursor on the image to see title, date posted and snippet. Just click on the image or title to go to that article. "BLOG ARCHIVE" (image below - boxed in yellow) works the same as "CATEGORIES" section image montage and follow the same chronological rules. Click on the down arrow, select a month, then simply click on a day to see all the articles posted on that particular day. They will show as an image montage. Hover cursor over the image to read title, snippet and date of posting, click image to read entire article. "SUGGESTED LINKS" (image below - boxed in yellow) are links to trusted sites that we either support or appreciate their efforts in bringing and sharing information which is vital to the public to understand and stay informed on issues that need addressing. Some or many of their articles are featured here on this site also. Simply click on the site name (link) to visit the site. "Related Posts" (image below) are articles of the same category, relevance, authors or type. Whether they be Exclusives, Features, guest authors or other articles. They can also go by information type like Technology, Humor or Health. Just place cursor over any image or title you wish to go to and left click. You will be taken to the article. There are two comment types. "BLOG COMMENTS" (image below - boxed in yellow) are typical site comments and operate in the same fashion. Just type what you would like to say in a new comment or a reply to existing. Select which account you want to use - Google, Wordpress or Open ID etc and select "publish". "FACEBOOK COMMENTS" are not utilized, so it will not function. 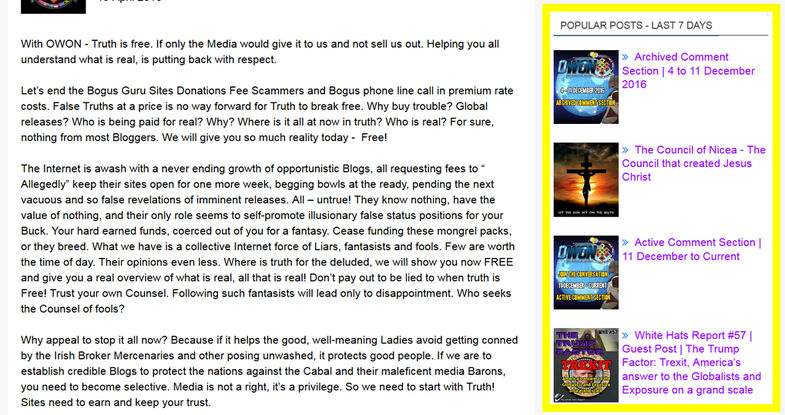 Found at the bottom of every page are our Social Network Buttons (image below - boxed in yellow). Click on to follow/read, or in the case of the RSS Buttons read and/or subscribe, to new posts and/or comments. 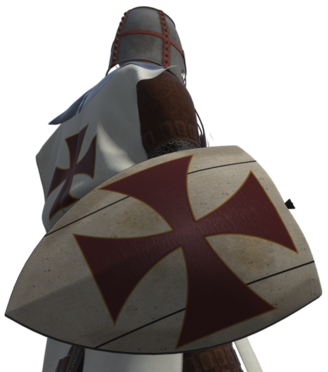 For RSS buttons, just hover cursor over image to identify comments or posts (posts left - comments right). Now onto the search function (see images below). When using search, try to use article title or category for best results. Click on the search icon (first image below - boxed in yellow), then type in the desired text on the search line (second image below - boxed in yellow) and hit enter to begin search. Findings will be shown as an image or image montage and may have several pages depending on search parameters. The search icon can be found at the top of every page for ease of use. 1) At the bottom of every page you will find two RSS buttons on the right hand side beside the Google+ button. The one on the left is for posts and the one on the right is for comments. Click on either one. In posts you will see all the posts in a linear format. 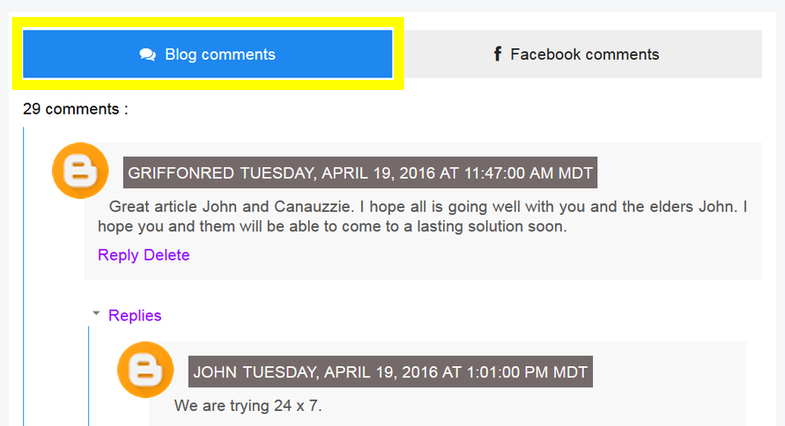 If you select comments the same, you will see most recent comments in a linear format. Click on any of the blue headings to go direct to the article or for comment RSS, where the comment is found. You may or may not subscribe, your choice, but you can always view in linear format when clicking on the RSS buttons. 3) As an alternative you can follow us through our Facebook page, VK page or our Google+ page if a more linear format is what you are looking for. 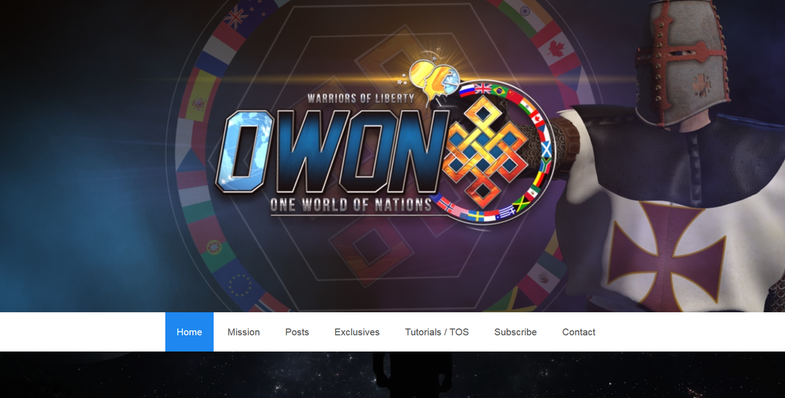 Just click on any of the articles posted and you will be transferred to our main site to read that article in full, to comment or read comments on our main site oneworldofnations.com. You may also choose to follow us on Twitter. All articles posted go to our twitter feed and can be accessed by direct links from there. 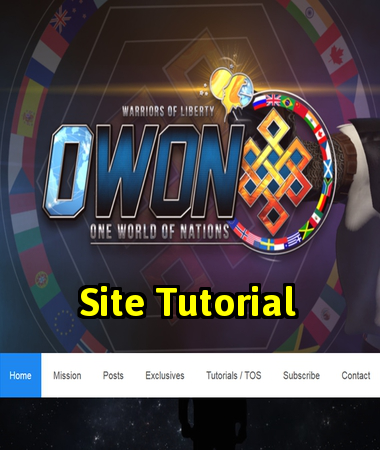 Note to Visitors: If you choose option #3, keep in mind that none of OWON's "COMMENT SECTION" links are posted or tweeted on any of our Social Media sites. If you are interested in reading the article we used for this tutorial, it can be found here.